"Totally recommended IT software company"
They endow us to get placed into the market very rapidly with unique built mobile applications that help businesses to generate revenue. Their professionals are expert in crafting stunning apps. Thanks a lot, iMOBDEV. Nothing to consider here due to total appropriate work, good job! Atomic Object creates custom web, mobile, and embedded software applications for clients ranging in size from startups to the Fortune 500. * We monitor all iMOBDEV reviews to prevent fraudulent reviews and keep review quality high. We do not post reviews by company employees or direct competitors. Validated reviews require the user to submit a screenshot of the product containing their user ID, in order to verify a user is an actual user of the product. 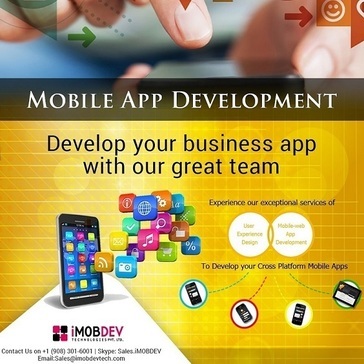 Company: iMOBDEV Technologies Pvt. Ltd.
Hi there! Are you looking to implement a solution like iMOBDEV?